Great question: what do you do for the world? Job titles come and go. Work responsibilities change. How we go about making money in order to live most probably will be different today than it will be ten years from now. What we do for the world is lasting. The day I read the comic, I received a photo of a young Native American girl wearing a paper mask. She made it at the Vacation Bible School being led by Presbyterians from Chicago on the Lake Traverse Reservation in South Dakota. The masks were individual creations signifying that God loves each one of us as the beautiful, unique beings that we are! What those Presbyterians were doing for the world was giving a little girl (320 little boys and girls, in fact) the sense that she matters and is loved immensely by the most wonderful One. Though we all miss him terribly, my teenage nephew has taken to spending his summers as a counselor at Boy Scout Camp. I know he has a ton of fun, but he’s also in service to the campers who attend. He’s part of the team of leaders who are providing the time and space for campers to become better versions of themselves as they grow in confidence, teamwork, and skill. I know teachers who don’t just teach to the test, but seek to build character. Managers who do what they can to lighten the load for employees — not just for productivity sake but because they recognize when a person is going under. People who commit to visiting seniors weekly — bringing not just meals, but joy to the day of an otherwise isolated person. I’m not sure we always realize it; but in all these ways, and so many more, we do something so very significant for the world.
. . . for the world? This entry was posted in Daily Insights and tagged benefit to the world, Daily inspiration, Lake Traverse Reservation, Presbytery of Chicago, service on June 29, 2014 by RevJule. Anyone having a warm-fuzzy view of Jesus, who thinks he’s all about loving our families and being seekers of peace in this world; probably doesn’t like this part of the gospel of Matthew. “Do not think that I have come to bring peace to the earth,” he’s quoted as saying. “Man against his father, and a daughter against her mother . . . one’s foes will be members of one’s own household.” And “whoever loves father or mother more than me is not worthy of me” (Mt. 10:34, 36, 37). Tough words that don’t necessarily match up with things elsewhere in scripture that he’s recorded as saying, let alone the Jesus so many of us love as our confidant and friend. I’ve only ever met one person in the world who actually loves this text. I don’t remember his name. But I vividly remember his story. I met him one night in Pakistan. It was the days before most Americans even knew where Pakistan was, let alone what life was like there. It was the summer of 1993 and I had been chosen by a Presbyterian Missionary Conference to be in service for 8 weeks with 4 other college young adults. When I got the acceptance letter with the news of where we were heading, the first thing I did was found a map to look up where in the world Pakistan was. The next thing I did was call my parents to tell them the news. And while it wasn’t the first time they heard me tell them of plans to travel oversees for some sort of mission; they were not at all thrilled. Because: Pakistan?!! That’s like a whole world away! . . . Over the course of the next few weeks, we were sent various articles about Islam and the ways of this Muslim country. I learned that religions other than Islam legally were tolerated. But of course toleration and full acceptance are two very different things. I learned that out in public, I would need to keep my arms and legs covered at all times – and be ready to cover my head too depending upon where we were. I learned that I would need to know the proper greeting for most Islamic countries: “As-salamu alaykum,” I would hear. To which we were to respond: “Wa alaykumu al-salem.” Loosely translated it was: Peace be upon you; and unto you peace. Based out of the busy city of LaHore, I spent my summer meeting various Christians of the country. My charge was to listen to the work they were doing at such places like the YWCA, the Christian Blind Society, a Christian Broadcasting Network, and a self-development training center for women. At the time, I think the Christian population of Pakistan was somewhere like 1% — in other words, being a disciple of Christ then and there was not a very popular pursuit. Nor were Christians across the country very well connected with each other. My work that summer was to learn how Christians were serving those in need in order to compile a resource that pastors and other church leaders could use in connecting those able to serve with places they could do it, and those needing to be served with ministries that could handle their requests. Somehow, one Sunday night, our group met a man. I remember him rushing in to the home where we had gathered. In Urdu he said some words to the American mission co-workers who were with us. Then we all took seats in the living room. It was almost like we were having a little house meeting as the earliest Christians would – meeting for prayer and fellowship at the close of the day. Mike, one of the American mission co-workers, stood next to the gentleman who looked kinda tentative but eager to speak. Over the course of the next half-hour, the man told us (with Mike translating for us) that he was a follower of Christ. He told us how he had come to hear of the life, death, and resurrection of Christ. He told us how he had learned of this one who spurred on the Christians of Pakistan to treat others with kindness and mercy and the human dignity they deserved no matter their religious affiliation. He told us of how he and his fellow Christians came together to rely upon one another and to serve those forgotten by the rest of society. How they were willing to take risks and even go against the ways of their elders if they must because of the love, forgiveness, and hope they had come to know through Jesus Christ. At long last, Mike broke in to tell us details the man wasn’t sharing. Details of his life that we really needed to understand. This man was the son of a prominent Muslim Imam. His uncle and his father both followed in the footsteps of their father to be important leaders of local mosques. He was to as well. Instead, when this man decided as a young adult to follow the ways of Christ, his biological family disowned him. He was like a stranger to them. In his context, he knew that becoming a disciple of Christ would set him at odds with those he loved most. There was something about these words of the gospel of Matthew that became a great comfort to him. Now, before we jump to any false conclusions about how terribly divisive Islam is, we can remember that Christians too have experienced this kind of rejection by their own Christian families. It still happens today – you know it. One follower of Christ doesn’t agree with another’s understanding of it all. One disciple seeks to be true to who they’ve come to know in God through the good news of Christ, and the others are of a different ilk. Before you know it, folks are being holier than thou at the family reunion – if they’re still talking at all. It happened quite a bit for the first followers of the way. For many of them, their families were Jewish who kept to the ways of Judaism, even if one called Jesus of Nazareth claimed to be the long-awaited Messiah. As the movement spread, it was Greeks and Romans, who had notions of other gods. Before Christianity became the religion of the Roman Empire in the Fourth Century, it took a whole lot of courage to go home to tell your parents that you were going to start living in the manner of Christ. . . . Doing that, you too might find yourself ostracized by your loved ones – or worse. In fact, it was another man in Pakistan who first taught me a great wisdom about such religious exclusionism. He was one of the most peaceful, serene, Christ-like persons I ever have met. He was Muslim and worked alongside me each day at the office of one of the Presbyterian missionaries. Everything about him embodied Christ for me: his gentleness, his generosity, his joy. He went out of his way to tell me more about Islam and the way it grounded him in being a person of peace in this world – a seeker too of justice. Something about him made me begin to wonder if, though we were walking different paths to God, was it all really the same Way, the Way I know as Christ? He’s one of the first persons to tell me that extremists exist in any religion, which can give us all a bad name. He firmly believed that when our religious practices fail to embrace and embody the highest principles of the Love to which they’re supposed to point us; then something has gone awry. Anyway, that’s the wisdom my Muslim co-worker taught me that summer. The thing is that following in the footsteps of one who heals the sick, befriends the outcast, and casts out that which leads from life; following in the footsteps of that Teacher very well can lead to some very strong reactions. One commentator helpfully reminds that “if Jesus were really the . . . nice guy we often insist on imagining, should he not have been able to stay out of trouble? . . . Kingdom work, it turns out, is more controversial and subversive than conventional kindness. If the teacher gives offense (as Jesus did to those of his day), how much more the student?” (Feasting on the Word, Yr. A, Vol. 3, Lance Pape, p. 167). It’s the reality with which we have to wrestle. I’m not saying we have to get out there to intentionally bring division. Rather, the message of Jesus in this part of Matthew’s gospel is that we very well may. In the words of that same commentator, “true discipleship is the art of seeking the kingdom with single-minded determination and letting the chips fall where they may.” According to that commentator, “The church that always manages to glide through life without ever rubbing anyone the wrong way may have reason to question whether it is truly this Jesus it honors as master and Lord” (Ibid.). This Jesus, of Matthew’s gospel, is summoning twelve of his followers and giving them authority to go out doing the same things he is: proclaiming good news to those of their own nation who are being preyed upon by a religious system that had become entrenched with those seeking gain for themselves on the backs of others; those perverting God’s good news in fear of the oppressor; those turning their heads from the suffering of their brothers and sisters. This Jesus is coming as a balm to those who have lost hope in the confines of illness and death and social exclusion and forces beyond themselves. This Jesus is telling his followers to be learners and doers of his way – knowing that some are going to scoff. Some are going to say no way. Some are going to cut you off because they won’t accept such a God. That’s literally what was going on for the community to which Matthew first wrote, so that they needed to hear the good news that “even the hairs of your head are counted by our loving God. Do not be afraid; for you are valued as precious by God. We will be held through it all” (paraphrase of Matthew 10:29-31). This Jesus is telling those who would follow after him that the way will not always be easy. We might find ourselves locked out of one family – though thanks be to God another family is ready to welcome us in. It’s the road we must walk, come what may, if we want to be called worthy by our Lord. If we want to know the joy of full-acceptance by our God. In the end, it’s the way of losing ourselves, as the Jesus of Matthew’s gospel here says, in order to find true Life. . . . Despite the cost, no matter our fear; may our days be blessed as we follow in the footsteps of our Savior and Lord! This entry was posted in Sermons and tagged 22 June 2014 sermon, 2nd Sunday after Pentecost sermon, family divisions, religious exclusionism, Sermon on June 27, 2014 by RevJule. Seventeen hundred years ago, the church was fighting about the Trinity. It can be a confusing concept which we have great difficulty wrapping our minds around. It is, after all, a mystery. Though this gospel reading of Matthew makes reference to baptizing in the name of the Father, Son, and Holy Spirit; it doesn’t explain the relationship between these three. Nor does it seem to worry about delicately holding the tension of the three-yet-Oneness of God. To make matters worse, the Trinity’s not clearly explained anywhere in scripture. In fact, the word Trinity never is used. The gospel of John’s farewell discourse of Jesus (chapters 14-17) might be the closest attempt to talk about this God that is in us even as we’re in God, and Jesus is in God, and Jesus is in us, and another Advocate, the Holy Spirit, will be among us forever. But that whole section can be more trouble than help. We do have the second letter to the Christians in Corinth which closes with the message: “The grace of the Lord Jesus Christ, the love of God, and the communion of the Holy Spirit be with all of you” (2 Cor. 13:13); though the benediction isn’t really explaining Trinity as much as it is naming for the first followers of Christ’s Way the experience of the grace, love, and companionship of God – the various aspects of God that can be real in our lives. And just as Christianity began to gain some ground in the Roman Empire of the early Fourth Century, the church started fighting about the Trinity. It’s called the Arian controversy. A man named Arius and a man named Athanasius led the way. They stood at polar opposites about the nature and power of God. Arius (wrongly) was convinced that the Son and the Father were not co-eternal. “’There was when he was not,’” Arius said – referring to an independent God (the Father) creating Jesus (the Son) right alongside everything else in creation – something we Christians do not believe. For Arius, “God was an utterly unique, self-contained, and self-sufficient reality” (Feasting on the Word, Year A, Vol 3; Stephen B. Boyd, p. 46). . . . Fathers’ Day seems a good time to remember that the church did not accept this notion of God. For how long has our culture, especially tried to tell the males of it, that they too are individual? Self- contained. Sufficient all on their own. Arius was terrified of any sense of vulnerability in God. For him an eternal partnership with the Son, not to mention the Holy Spirit; implied weakness in the deity. You know, one that could be affected by another; changed by another; to Arius that was weak. Unacceptable in any sense of God – which tells us that Arius may not have been reading the scriptures very much because it’s all over the stories. This amazing Deity who chooses to come to us in such a vulnerable way. This God who feels and weeps, and deeply is affected by the faithfulness and waywardness of God’s creation. . . . I know a mindset still lingers in our society: that to be a man is to be like this invincible, independent, hover-a-little-bit-above-it-all kind of god. Fortunately, scripture gives witness to something else, so the church decided to follow Athanasius. As one commentator explains: “Athanasius believed that the incarnation of God in Christ revealed a different kind of God and a different kind of divine power. 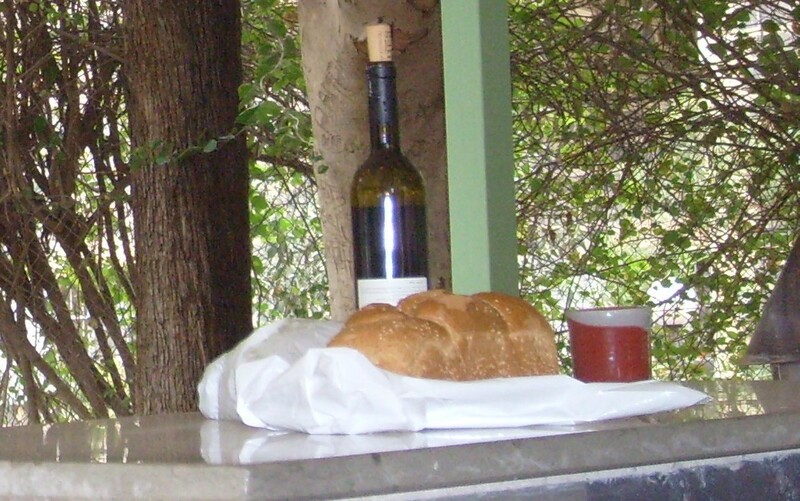 Rather than an isolated monad, God from eternity is relational; between the Father and the Son, for example, there was, is, and always will be mutual self-giving. . . . a ‘unity of love, a unity in which the identity of each party is not swallowed up and annihilated, but established” (Feasting on the Word, Year A, Vol 3; Stephen B. Boyd, p. 46, 48). It’s a mutuality. A shared being. An inter-dependence where three co-exist in beautiful harmony with one another – like a perfect musical chord. One’s not more important than the other; they’re all necessary. Distinct, yet equal. One never without the others. It’s often called the peri-choresis of God: the dancing around in great delight. A circular image of God where the God beyond, among, and in us exists in this joyous right-relationship. Almost like a synergy or living sphere of powerful energy. A God who is plural, yet one. . . . It’s a much better message for the men and women of our culture – a helpful, healthy way to be reflected in our own relationships at home, in our congregation, and beyond in all the world! . . . I love how one preacher put it by saying that: “God does not exist in solitary individualism but in a community of love and sharing. God is not a loner. This means that a Christian in search of godliness (Matthew 5:48) must shun every tendency to isolationism. The ideal Christian spirituality is not that of flight from the world like that of certain . . . traditions where the quest for holiness means permanent withdrawal . . . away from contact and involvement with people and society” (http://www.munachi.com/z/trinity.htm). It means getting in there. Living rightly alongside one another, even as we tenderly tread upon this earth. In officer training this week, one of our officers-elect explained it beautifully. A person can be daughter and a sister and a wife and a mother and a grandmother. And in all those ways how she is in each of those roles is influenced by the other; but she’s still one woman – and so much more even than just those roles. Boys too: sons, brothers, husbands, fathers, and grandfathers – all impacting how you are in each one of those, but more than each one too. I like that. Especially because it gets at the heart of why the Trinity matters: because in the image of God we are made. Not a power unto ourselves to do whatever we want with one another and the rest of creation. But a relationship – a mutuality. In other words, though we may have been reared in the great Western independent philosophy of “I think therefore I am;” the African inter-dependent notion of Ubuntu would have been a more Christian way to have been reared: that I am because we are. As South African Archbishop Desmond Tutu so often proclaims: our human-ness is bound up together. In many ways, Trinity captures not just the truth of God, but also the truth of us. We never are one all on our own. Each one of us always is in relationship with God and the rest of creation, even as we are with our own self. In other words, three: a self, God, the rest of the world. We too are thoroughly relational no matter how much some of us might try to fight it. We may not be able to explain it all; but we certainly experience it. I’ve been reading about something called the Law of Three. I admit I don’t fully understand yet all of what this contemporary Christian mystic is trying to say, other than that there is a metaphysical Law of Three. Our world isn’t just binary opposites like yin and yang, male and female, dark and light. Rather it takes three to make anything happen: like a seed in the fertile soil. Without the third element of the sunlight, that seed never will sprout to grow. (Cynthia Bourgeault, The Holy Trinity and the Law of Three, p. 40). About the Trinity, this mystic writes: “A solitary God could not be ‘love without limits.’ . . . The Three-in-One denotes the perfection of Unity . . . fulfilling itself in communion and becoming the source and foundation of all communion” (Ibid., pp. 43-44). Returning to the gospel of Matthew, that might be why the Risen Christ commands his disciples to go baptize in the name of the Father, the Son, and the Holy Spirit. Because first of all, it’s going to take something outside of us to get us out there. A force; a power; a Spirit beyond us to motivate us to go forth into all the world with the good news. Second, thanks be to God, we have a most beautiful example of how to do this: Jesus himself, God-with-us, or the God among us, divine yet seeking to live a flawless human life. He held in perfect harmony those right relationships between God, self, and all creation. And third, thanks be to God, we have something within us: the Spirit of God burning like a fire within to give witness to the love, and hope, and forgiving grace of God. In our baptisms, we’re marked with the sign of the Triune God – the God beyond, among, and within us – we’re marked by them all in baptismal waters that we might live in God’s likeness as we delight in such beautiful balance with God, self, and the rest of creation. As we go forth into the world, that’s the good news our lives are to reflect! That we do not go it alone. Trinity matters because our God is beyond, but among, and in us too! And like God, we work best in threes: me, you, God with us. As the wisdom writer wrote: “a three-fold chord is not quickly broken” (Eccles. 4:12b). Together we can fulfill the Risen Christ’s command – or at least begin to try. In the name of the Father, Son, and Holy Spirit; we go forth to give witness to our mysterious, Three-in-One God. This entry was posted in Sermons and tagged 2014, Matthew 28:16-20 sermon, Sermon on June 15, Sermons, Trinity Sunday Sermon, Ubuntu on June 23, 2014 by RevJule. Exciting things are going on in the church of Jesus Christ. And I’m not just talking about the excitement I see in you men who are rolling up your sleeves to take care of our building; and those of you helping the people in need who come to us each week; and those of you who are eager to experience some other forms of worship in a few upcoming Field Trips we’re working on organizing during this transitional time in the life of this church; or those of you asking for a book study in people’s homes that we hope to launch in a few weeks! All of which are really exciting things among us! . . . I realize we can get so caught up in worry about declining numbers and church dogma fights and budget crunches. But lots of evidence points to a vibrant future for the Christian faith. While it’s true, as one author has said, that in the USA, the first decade of the 21st Century has been the “Great Religious Recession.” It’s equally true, according to that same author, that we’re living in the era of an emergence of “a spiritual awakening, a period of sustained religious and political transformation during which our ways of seeing the world, understanding ourselves, and expressing faith are being ‘born again’” (Cheryl Jones quoting Diana Butler Bass in Journal for Preachers, Pentecost 2013, p. 3). It’s exciting! It’s a great, even if challenging, time to be alive! . . . Supposedly we’re in the midst of “moving from being a religion about God, to being an experience of God” (Cheryl Jones, Journal for Preachers, Pentecost 2013, p. 4). From the what of faith to the how of faith. From what’s been called an Age of Belief to an Age of the Spirit. It’s very good news for the church of Jesus Christ because more than ever in the history of this nation, spiritual experience is what people want. The research all points to a rise in those not affiliated with any church; yet craving connection with God. Unlike Americans of the past who weren’t a part of any religious body; when those of the past turned away from the church, they turned away from God all together. Atheists and agnostics used to abound. The what of belief was their crisis – and, in response, the what of belief was the church’s key witness. . . . But today we’re told those who won’t be a part of a church still seek some sort of experience of the Divine. They want wonder. They want awe. They want a glimpse into the mysterious. They want the rituals and practices that will bring them into deep connection with that which is beyond themselves. In other words, they want the how of faith. They just don’t think they can find that among us, the church. We, who religious non-affiliates of today seem to believe, spend more time propping up and preserving an institution than seeking to live the how of faith – than being in true connection with the living God. And more than any other day of the liturgical calendar, today is a great day to celebrate the craving for the spiritual over empty religion. Today is Pentecost – the feast of God connecting with God’s people. Pentecost: the outpouring of the Holy Spirit. That uncontrollable force like the rush of a mighty wind. Something, we’re not sure what, but as best as it’s been able to be described, something like flashes of fire. Little flickering flames alighting around each believer present. As far as we know, 120 gathered together in Jerusalem on that day. Jesus had instructed them to wait together for the coming of the Holy Spirit. They were being given such a lofty commission: to go – be witnesses of the good news of God’s unmerited, redeeming love, shown fully to us in Christ Jesus. They were being sent to speak in the ancient halls of religious power in Jerusalem. To the first ring of those living a bit further out than that, and all the way beyond to lands they had no idea even existed. To places like Hermitage, Tennessee – which surely had to be the ends of the earth according to their world view. Those first followers of the Risen Christ were going to need more than their own abilities for such a commission. They were going to need POWER: the power of the Holy Spirit – God’s very self living in and among them. To keep them courageous and open and going when all the evidence in front of their eyes said: stop. They, and most of the rest of the Jewish world, had gathered in Jerusalem for the Feast of Weeks, Shavuot, “the third of the three great festivals of Judaism. . . . Shavuot was a joyful festival, in which the first fruits of the harvest would have been given to God” (Margaret P. Aymer, Feasting on the Word, Yr. C, Vol. 3, p. 15). It was the celebration of God’s giving of the Law to Moses and their ancestors. It was a significant commemoration of God’s covenant with them – the giving of the Torah, which would make Hebrew slaves into a covenant community for God. . . . And at that moment – as those excited about the Risen Christ were together for Shavuot – like an avalanche that cannot be stopped, the Holy Spirit came! . . .
It’s curious that images like wind and fire are recorded about that day. . . . A few months ago I saw a map of the United States that had Home of the Hurricane written across the Southeast, Tornado Alley written across the Midwest; and Wildfire Way written across the West. It was a spoof about the current state of our weather; but it makes a point: wind and fire are powerful forces. Two of the main elements of our earth that no matter what we do really cannot be controlled. In fact, they can be the source of such immense destruction. . . . Which leaves me wondering how many of us don’t have something within us individually – and collectively as a congregation – that needs some blowing out; some burning off in order to make us what is needed for God? Some of us harbor old understandings of ourselves and others that need to be cleared away. Some of us cling to hang-ups about our personal abilities – or maybe our collective abilities too. Some of us let life-long fears or worries steal our chance at living fully alive here and now. We need something like wind and fire to blow all that away; burn all that out of us kinda like John the Baptist said long ago. In the gospel of Matthew he was recorded as speaking of the fire that will be used to burn out of us everything that is not life-giving: the chaff. The part of the wheat that is inedible by humans. Wind separates the grain and the chaff in winnowing when it’s tossed up so that the chaff is blown aside and the grain falls to the threshing floor (en.wikipedia.org/wiki/Chaff). Remember those words often lifted up in Advent: “His winnowing fork is in hand, and he will clear his threshing floor and will gather his wheat into the granary” – that’s the good stuff in us that does feed others. “But the chaff he will burn with unquenchable fire” – the parts in us that are no good for God’s life-giving mission in the world, it’s like they are burned out of us with fire. Might that be part of the work of the Holy Spirit? To destroy in us what keeps us from the mission of God. Of course we know that wind and fire aren’t just destructive. They also can be powerful, uncontrollable sources that make amazing things happen. Think of full sails that can carry a ship far across the ocean. Think of the flames that can fire up an engine to move a massive train from one end of our country to the next. Wind and fire are powerful forces in this world that can put into motion magnificent things! That, we’re told, is what the Holy Spirit of God is like. A few years back, I started getting really serious about the Holy Spirit – I realize not many Presbyterian preachers may make such a statement. But I just had finished teaching a year-long confirmation class with senior highs who said at the close of the year that they had no idea what the Holy Spirit was about. It was a wake-up call to me as their pastor and to that congregation as a church that whatever it was: our own lack of understanding, or emphasis, or fear, or something was hindering the spiritual life of our young people. I started doing some reading – the natural thing we Presbyterians do when we are confused about God. As an object, we study it. Soon my spiritual director was encouraging me to put down the books and just listen. Be quiet. Wait. Because God is not an object to be poked and prodded; God is a living subject in, among, and beyond us. I asked church members to join me as we did some contemplative prayer together; we practiced a few other kinds of prayer too that would attune us better to God. We even started singing songs about the Spirit from the hymnal. 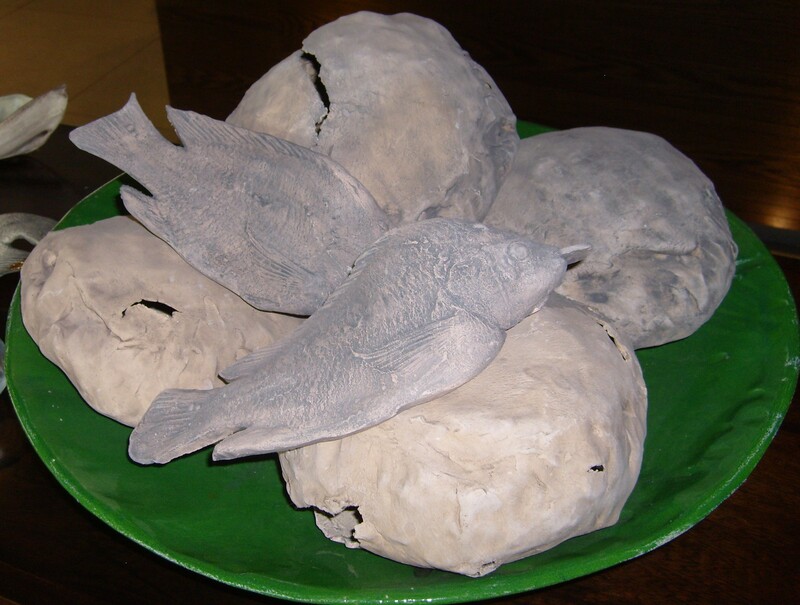 Somehow or another, the next time confirmation class rolled around, I was astounded to hear that class of confirmands heartily include the Holy Spirit in their personal statements of faith – they articulated not just what they believed about the Holy Spirit but how they experienced it. I kept the words they wrote about the Holy Spirit because I was moved so deeply by them. That group of young persons spoke about the Holy Spirit as: “The breath of God . . . everywhere . . . powerful . . . always with us.” One of them wrote: “You can’t see it, but it’s with us everywhere we go. . . . The Holy Spirit is like the air we breathe, because you need it to survive, and it keeps us going.” Another wrote: “I believe the Holy Spirit is kind of like the wind. You can’t see it, but you can feel it. That’s how (God’s) always with us – through hardships, (and through the) happy moments in our lives.” The quietest boy in the class wrote: “I believe in the Holy Spirit that is always with me, even though I can’t see it; I can feel it. I believe the Holy Spirit is the glue that keeps us believing and doing good deeds. (The Holy Spirit keeps) my faith in God when there is chaos around me.” And finally one professed that the Holy Spirit “is everywhere we go. It lives inside of us. It comes from God” (Quotes from 2012-13 COTC Confirmands). Everywhere. Mysterious, in that we can’t really see it – but we can experience it. We can use metaphors like breath of God, air, wind, the glue of our lives that keeps us believing. The ever-present God that lives inside of us. A gift that comes from God. It’s still the power that sends us out into the world – bound together to one another to carry out the very same charge given so long ago to the first followers of the Risen Christ. The Holy Spirit is the church’s experience of God living in us every day to be the church – the presence of Christ’s very body wherever we go on this earth. And the Holy Spirit is how we know an exciting future lies ahead for Christ’s church – if we’re willing to remain open to God’s living presence among us. For the Holy Spirit is God’s power in and among us to refresh and revive and re-create. The Guide that sends us out to live our faith – not just keep certain beliefs in our brain each day, but to enact the kind of behavior that shows God alive in us. . . . The Holy Spirit – the fire of God burning in us; the breath of God living in us – is our hope. . . . This entry was posted in Sermons and tagged Acts 2:1-21, Pentecost Sunday, Sermon on June 14, 2014 by RevJule. Photo by JMN – March 2014 Holy Land Pilgrimage: The fish and loaves at the First Century site of Magdala in Galilee, Israel. That’s right: the town of Mary Magdalene. Just up the road along the Sea of Galilee, Tabgah marks the site of the multiplication. 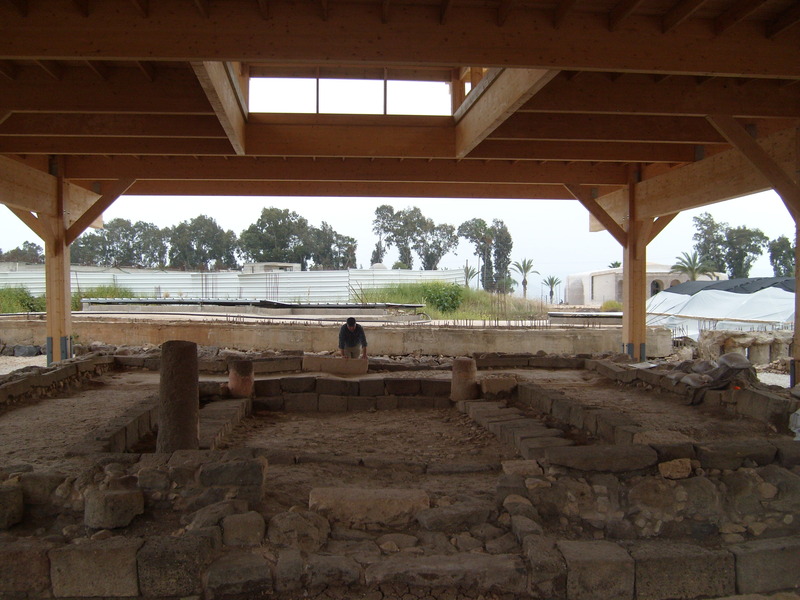 First Century Magdala was a prosperous fishing town. The synagogue recently unearthed there is amazing! So too is the new sanctuary that honors the women of the journey. To me this is an image of abundance, provision, nourishment, joy. May we all know such abundance, provision, nourishment, and joy everyday! Stay tuned for more images and insights from my recent Holy Land Pilgrimage. 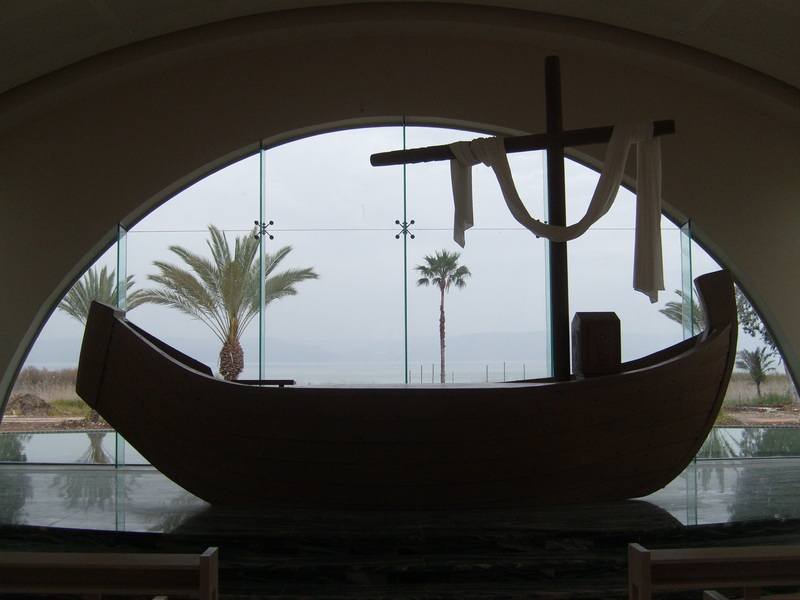 Photo by JMN – March 2014 Holy Land Pilgrimage: Chancel in Magdala, overlooking the Sea of Galilee. Photo by JMN – March 2014 Holy Land Pilgrimage: First Century Synagogue of Magdala. If this sermon were to have a title, a good one would be: Ascension??? . . . What’s it all about? Where in the world did he go? And what are we supposed to do now? So the Ascension of the Lord: what’s it all about? If any of us grew up Roman Catholic or Episcopalian, you probably could school the rest of us about Ascension Day, as it’s such an important part of those traditions. It takes place every 40th day of Eastertide, always two Thursdays prior to Pentecost Sunday, the fiftieth day of Eastertide. And it’s considered one of the main high holy days. In fact, in Roman Catholicism it’s a Holy Day of Obligation. Or a day in which everyone better be at mass or else! . . . Legend has it that as early as 68 A.D., or just a generation after his death and resurrection, the first followers were celebrating the day the Risen Christ ascended. That kinda makes sense because not only would that have been about the time first followers would have been passing on the mantel to the next generation, but also because those would have been difficult days when things with Rome really were heating up – the Jerusalem Temple was about to be demolished entirely. Reassurance of an ascended, sovereign Lord would have been a growing comfort. Ascension Day might have been observed as early as the First Century A.D., but we only have written documentation of such celebrations beginning in the Fifth Century A.D. – by the time both the Apostles’ and Nicene Creeds were around (www.officeholidays.com/countries/Europe/ascension_day.php). Which brings us to where in the world did he go? Now, I gotta be honest. We had a little fight about this in the pastors’ lectionary study I’m a part of. I kept asserted that I worry that too many of us are concrete literal thinkers. When we hear about ascension, if we buy it at all, don’t we too often picture the human figure of Jesus sitting somewhere up in the skies alongside however we picture God the Father to be? I worry that we don’t get the metaphorical understanding of the creeds’ words that “Ascended into heaven and is seated on the right hand of God the Father” (Apostles’ Creed/Nicene Creed) was language used to speak of the Risen Christ being the right-hand one of God, the Sovereign Ruler of the Universe – the beloved ambassador or trusted emissary of God sent on a very special mission. We don’t always get the metaphorical, military-like language (common to that day) that the Risen, Ascended Christ is the one who successfully has completed his impossible mission even as he’s begun another. When it comes to ascension, I worry that too many of us concrete literal thinkers, if we pay attention to it at all, just get caught up in a view of the victorious Christ risen from the earth into the sky now to rest up on a cloud somewhere right alongside God; as from afar, they wait to see how badly on our own we might mess it all up. Of course, a more seasoned preacher in our pastors’ bible study assured me that we 21st Century Americans don’t think that way. He assured me that we don’t see the world as the three-tiered cosmos of our biblical ancestors who didn’t yet know the earth is spherical, like a ball, instead of flat, like unleavened bread. Certainly Presbyterians in the pews, my preacher companion told me, know God isn’t just further up there than the astronauts have gone because it’s land here where we are, the fires of hell under below our feet, and heaven above where God and the angels reside – which was the ancient three-tiered view of the world. Rather, we know that this earth is one part of an amazing galaxy, in this incredible universe, where God is everywhere – in us, among us, and beyond us! Ascension up, as Acts of the Apostle’s describes with the words: “as they were watching, he was lifted up, and a cloud took him out of their sight” (Acts 1:9), is more like the Risen Christ taking our humanity into the eternal heartbeat of God. Having lived as one of us here among us, the Risen Christ, who is God too, brings who we are fully into the Godhead so that we are in a new communion with our God forevermore. That’s why ascension matters – because in Christ, we’re united with God in a way we’ve never quite been before. At last we can get on not just with worshipping our Lord as one to lift high on a pedestal. But in emulating him as the one lifted up as the Way. The Path. The Proto-type. The Hero in whose steps we walk. Which leads us right into what we are supposed to do now. Acts of the Apostles is believed to be something like the sequel of the gospel of Luke. And the ascension of the Lord opens Acts, just as it had closed the book of the gospel of Luke. This writer wants us to know that while the one born of Mary, raised in Nazareth, ministered primarily in Galilee before his trek to Jerusalem that got him killed and raised again – while Jesus the Christ played the leading role in the gospel of Luke; in Acts, it’s going to be his followers. Or the Holy Spirit of God working through his followers in the same way the Holy Spirit of God was working through Jesus all along. He kept telling his followers, like the gospel of John records (John 14:12), that it’s better that it happens this way so that we will do greater things than him. What we’re supposed to do now is fulfill the mission he passed on to us. I love that Acts opens with the apostles hanging out with the Risen Christ on the Mount of Olives, again overlooking Jerusalem. I’m sure the view was a bit chillier this side of crucifixion and resurrection. As the disciples stood on the same spot from which they first entered the city, pre-Passover; they easily could recall all the Holy Week events. They hear him saying something about being baptized not with water like John the Baptist. But they just want to know if it’s all about to be over, the whole kingdom of Israel restored. Giving them something else upon which to focus, the Risen Christ says: “It’s not for you to know the times or periods set. But you will receive power when the Holy Spirit has come upon you; and you will be my witnesses in Jerusalem (yes, the dangerous city where they put the Lord to death), in all Judea and Samaria (the provinces that don’t necessarily like such Galilean outsiders), and to the ends of the earth (which includes worlds you can’t even image – people so very different from you who may not even recognize their hunger for the Holy)” (paraphrase of Acts 1:7-8). They were hoping it all was about to be over. But it was just the beginning! . . . Instead, it’s a tall order he’s giving them. And according to how it got recorded in Acts, it is an order. You WILL be my witnesses from this spot right before you, unto ever-expanding circles beyond. What we’re supposed to do now is get busy. Or rather wait for the Holy Spirit on Pentecost, next Sunday, and then get busy! As he’s lifted up like Enoch and Elijah – two other righteous ones of God whose feet supposedly left this earth in the same way. While Christ is taken out of the-kind-of-sight they’ve been having of him since before and after his resurrection, the apostles have to have another message to get them to stop just standing around gawking up at the skies. They’re assured he’s coming back in the very same way. As they are standing on the Mount of Olives, the words must bring to mind for them the prophetic visions that the triumphant Son of Man will come down from the Mount of Olives into Jerusalem to reclaim it all as God’s own. . . . Acts records that they finally go back into Jerusalem and they stay together. Praying and waiting for this empowering gift that will infuse them with the courage and energy, determination and clarity to emulate the one now lifted before them. To be about the business of carrying on his mission even if it means standing before the powers that want him dead, engaging those so totally different from themselves, and journeying into the wild unknown. . . . Any who claim the crucified, resurrected, and ascended Christ as Lord and Savior are to get out there to fulfill the mission he’s entrusted to us. Do the greater things he told us will be done by the Holy Spirit through us! The Ascension of our Lord: I hope it’s gone from ??? to !!! This entry was posted in Sermons and tagged Acts 1:1-14 sermon, Ascension of the Lord, Sermons on June 4, 2014 by RevJule.